Act No. 516, Public Acts of 2002, p. 2. Act No. 516, p. 2. Tim Aben and Julie Stapelman, “Line Item and Boilerplate Summary,” p. 4. Lansing: House Fiscal Agency, January 2002. 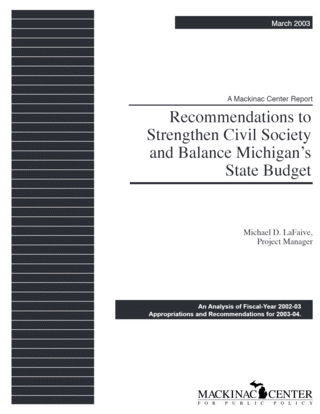 Aaron Steelman and Joseph P. Overton, excerpted from “Advancing Civil Society: A State Budget to Strengthen Michigan Culture,” April 1996, p. 9. Act No. 516, p. 3. Act No. 144, Public Acts of 2002, p. 2. Michigan Department of Agriculture, “Migrant Labor Housing Program, FY 2001 Annual Report,” p. 1. Accessible on the Internet at http://www.mackinac.org/3161. Telephone interview of Dan Wyant, director of Michigan Department of Agriculture, by Mackinac Center for Public Policy Director of Fiscal Policy, Michael LaFaive, Dec. 17, 2002. Aben and Stapelman, p. 16. Steelman and Overton, p. 93. Act No. 516, p. 4. Aben and Stapelman, p. 18. Michigan Department of Agriculture, Agriculture Development Division, “Inter-Office Purchases & Services Requisition,” Sept. 24, 2002. Michael LaFaive, “Make Michigan One Big Renaissance Zone,” Michigan Privatization Report, summer 2002, p. 5. Accessible on the Internet at http://www.mackinac.org/4473. Michigan Department of Agriculture, “Summary of 2002 Export Grants,” obtained through Freedom of Information Act in October 2002. Letter to Paul Burke of the Michigan Department of Agriculture from the Michigan Potato Industry Commission, Sept. 20, 2002. Food Bank Council of Michigan, “Who We Are,” accessible on the Internet at http://www.fbcmich.org. Future Farmers of America, “FFA Mission and Strategies,” accessible on the Internet at http://www.ffa.org/about_ffa/index.html. Act No. 516, p. 4. A $60,000 line item for fairs and festivals promotion was vetoed by Gov. Engler in July, 2002. The item was not subtracted from the total to ensure that the Gross Appropriation, above, would match the MDA budget, Act No. 516. Doing so would reduce the Mackinac Center’s projected savings by $60,000. Gary Heinlein, “Fair’s low turnout puts it in jeopardy,” The Detroit News, Sept. 22, 2002. Accessible on the Internet at http://www.detnews.com/2002/metro/0209/22/c01-593735.htm. “State Fair Succeeds Again,” The Detroit News, Oct. 21, 2002. Accessible on the Internet at http://www.detnews.com/2002/editorial/0210/21/a08-617449.htm. Telephone interview of Barb Hensinger, director of fairs, racing and expositions, Michigan Department of Agriculture by Mackinac Center for Public Policy Director of Fiscal Policy Michael LaFaive, Sept. 17, 2002. Telephone interview of Kevin Dubord, assistant assessor, by Mackinac Center for Public Policy Director of Fiscal Policy Michael LaFaive, Sept. 30, 2002. Author interview with Bill Woodman, horse-racing analyst, Fairs and Racing Division, Michigan Department of Agriculture, Sept. 23, 2002. Ibid., Interview with Barb Hensinger. Act No. 516, p. 5. Aben and Stapelman p. 24. In a Jan. 17, 2003 interview with Office of Racing Commissioner Robert Geake, author Michael LaFaive was told that the Equestrian Princess Pageant had been eliminated. No documentation was provided.